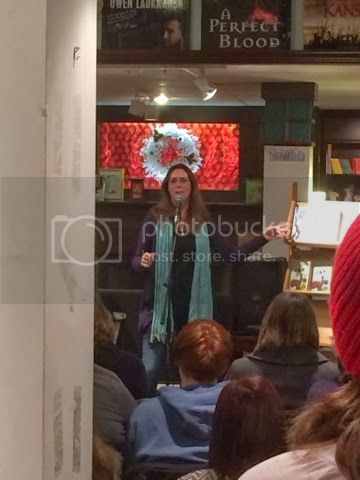 Nicola's Books hosted Laurie Halse Anderson this evening for her new book The Impossible Knife of Memory, so Sarah and I drove over to meet her. I've never read anything by Anderson before, so I was going in with no expectations, but she was actually a great speaker. She was very honest and frank to the kids there (the majority of the audience was teachers from the local schools and students), giving them some really solid advice about writing, what to do after high school, and what to do when you're striking out on your own. I was thoroughly impressed with her. I picked up her new book, and had my copy of Speak signed. Sarah had given me the copy of Speak ages ago when she found out I hadn't read Anderson before, and I hadn't really thought much of it since then. I think one of those two books will be moving up the TBR pile sooner than later. Cherie Priest Announces A New Book! I found my reading challenge for the year!